Two weeks I traveled with my friends Petra and Achim through Eastern Galicia and Northern Bukovina. It was a very intense and emotional journey to the heritage of a vanished Jewish world. We visited 27 towns and villages, many spots made a deep impression. With some distance I would like to summarize some experiences and reflect them. What did we see? Who commemorates what and how? And I want to thank all those people who enabled the journey in many different ways and observed it with passion. Galicia and Bukovina were multi-ethnic regions in Eastern Central Europe. Ukrainians, Jews, Poles, Germans, Romanians, Armenians, Gypsies, and other ethnic groups lived there. As a result of World War II, the redrawing of state borders and the Sovietization of public life after the war, the region has changed fundamentally. Nevertheless, all these nationalities are still present – a majority of Ukrainians, all other ethnic groups as minorities. Each nationality has its own narrative, their specific views on history, its own identity and its own view on the identity of their neighbors. Each ethnic group could give a good reason to a separate trip – a Ukrainian trip, Polish, German or Armenian one. I decided for a Jewish journey. With the exception of Poland nowhere in Europe have lived as many Jews as on the territory of Western Ukraine until the beginning of World War II. Nowhere was their contribution to culture, economics, politics and public life so obvious as here. A view on the Jewish culture of the region and its legacies is therefore worthwhile and important. Despite the clearly defined theme of the trip, we have also repeatedly taken a look on Christian cemeteries and churches, farmers markets, Ukrainian crafts, Polish castles and the beauty of the landscape. Yes, the country is beautiful. It floats in green waves. When we arrived, we saw the last snow patches, when we left, trees and meadows were in full bloom. In many of the small towns the architectural legacies of the Habsburg monarchy can still be found, and some more that is very much older. Off the main roads, next to unpaved back roads, you will encounter picturesque villages with beautiful old wooden houses. Over all hatch the storks. Much of what we thought to be picturesque, many locals would describe as poverty. In fact, the country is poor. In the cities this is less noticeable, on the flat land it is clear. 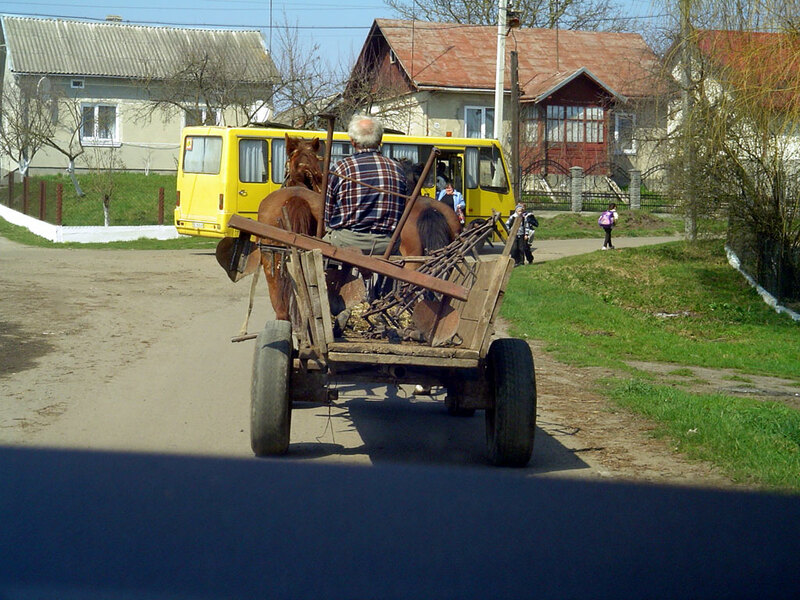 Horse carts are still common for transport. In many areas we have not seen any mechanized agriculture. The plows are pulled by horses, sometimes by people. Sowing and harvesting is done by hand – often on small pieces of arable land, that one can hardly imagine how it would feed a family. We rarely had unpleasant experiences with people who did not want to talk to us or were bothered by our questions for synagogues and Jewish cemeteries. This unpleasant experiences did occur, but far more often we met people who shared our enthusiasm for history. People who shared their knowledge, who wanted to show us something important to them and who observed what we were doing with curiosity. This interest and hospitality expressed by them have often deeply touched us. Since we asked for synagogues and Jewish cemeteries, they have probably thought us sometimes to be Jewish visitors. Once I was asked if I had relatives buried in the cemetery. There was serious compassion in the eyes of the questioner and relief when I shook my head. In addition to the many positive experiences, there are of course also different ones: people who do not have the slightest idea of the history of their town and are not able to locate any historical site. Mostly we got aware of this in towns that went through a total exchange of poulation, where roots were cut and no local oral history goes back to the pre-war period. We also met people who do not like to talk to strangers, museums that falsificate history, public administrations that just watch the decay of local heritage – not only the Jewish heritage. All these aspects exist, but I am not able to quantify them. Overall, we have been at 27 locations. From all I have reported. More than I dared to hope. Galicia and Bukovina are covered with the remains of the Jewish past. In our search, we have focused on cemeteries and synagogues. We could have expanded our project to orphanages, cheder, shops, schools and residential buildings. This would have caused a deeper research and a longer stay. Both is beyond my possibilities. 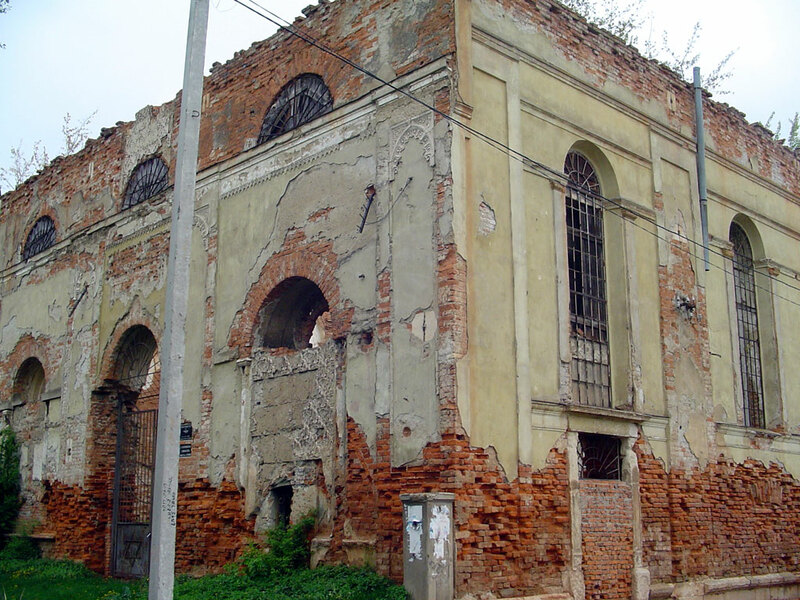 Throughout all former synagogues that we have found, are in poor condition. They are either ruins or are misused as workshops, gyms or movie theaters. Synagogues to which a Jewish community belongs, and which are therefore preserved and maintained, are rare exceptions. They are exclusively found in larger cities. Where there is no more Jewish life, and this was the case in the majority of the location we visited, we have found not a single former synagogue that was transformed into as a museum, monument or any other appropriate use. The Jewish cemeteries are either partially destroyed, are overgrown jungles or have great conservation problems. Nevertheless, there is reason for hope. In many places, renewing and maintaining of cemeteries is completed, has already begun or has recently started. However, the conditions differ from place to place. In only one case – graffiti with swastikas and SS runes in Nadvirna – we saw recent destructions. All other defects are from earlier dates. In two cases – Zabolotiv and Rohatyn – we found the cemeteries misused as garbage dumps where neighbors throw their trash over the fence. Only in a few cases, we have found a source for the initiative to restore a cemetery. 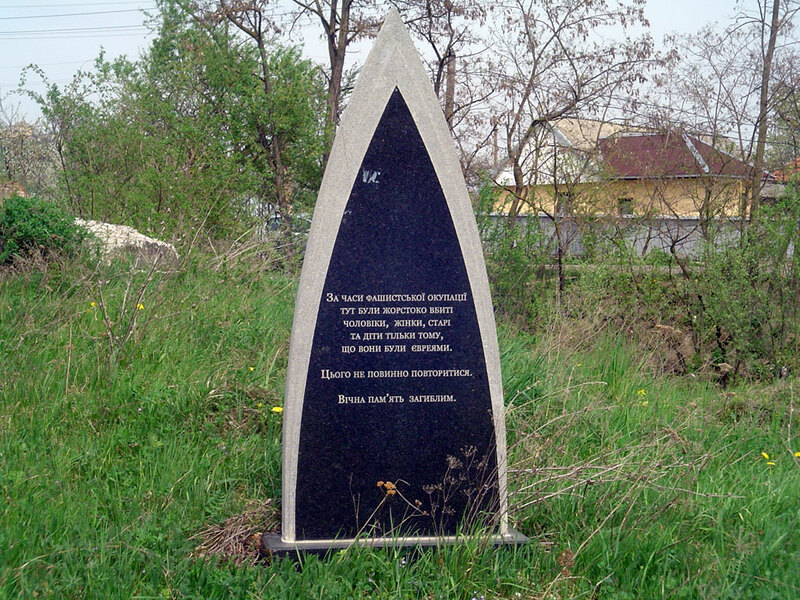 In Vashkivtsi there is a memorial stone which appoints members of Wiznitzer family. In case of Chernivtsi (Czernowitz) I know that the initiative has no local origin. In places like Kuty, Sadagora and Vyzhnytsia where there were significant Hasidic communities, there are good reasons to assume that initiatives go back to Hasidic groups in Israel or America. Despite the destructions from the occupation and Soviet period, we found some cemeteries in exemplary good condition. Examples are Berezhani, Pidhaitsi, Halych, Bolekhiv and Kalush. In some cases, the cemeteries are under observation of the neighbors. They watch who comes and goes. We repeatedly met people who expressed regret or dismay about the state of Jewish monuments. They even expressed shame. These people were helpless. They do not know how they could begin to change something. In Ukraine, there is a lack of civil structures in society, and initiatives coming from abroad obviously do not integrate these people. Almost everywhere we have seen on our trip conically shaped memorials that are modeled after the famous tomb of the Athenians in the plain of Marathon. On them flutteres in blue and yellow the national flag of Ukraine and in black and red the flag of the UPA, the Ukrainian Insurgent Army. Usually this monuments are found along the roads, at the entrance or exits of towns. Often they are in the immediate vicinity of a Soviet war memorial for the fallen soldiers of the Red Army. As with its historical model, the message is selfless sacrifice for a just cause. Ignored – or consciously accepted – is the fact that members of the Ukrainian national movement during the war-time took an active part in the destruction of the Jewish population, and also in attacks against the local Poles. In Galicia there is a competition of towns and villages to larger monuments for Stepan Bandera – the leader of OUM and UPA – or other local members of its leadership. This single-sided frame of reference for the Ukrainian national movement in its struggle for national independence in public monuments is irritating. The history of the Ukrainian independence movement is diverse and complex. It covers the entire political spectrum from anarchism to an racist and anti-Semitic nationalism which is typical of the war and interwar period in Europe. The last one is represented in Ukraine by Stepan Bandera and OUM and UPA. 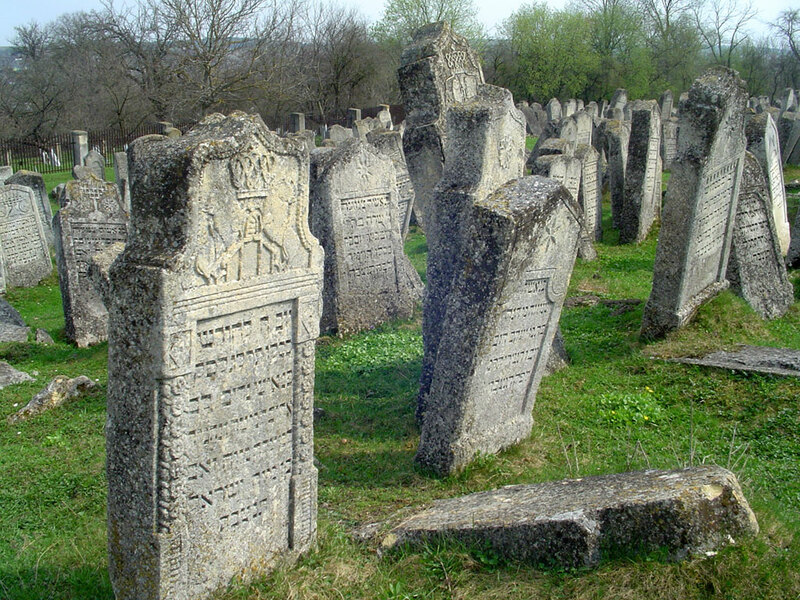 Although many mass graves of the victims of the genocide on the Jews of Western Ukraine are still not identified and not labeled, there is no shortage of monuments and public memory locations. Mostly, the monuments are found where the crimes were committed, for example, in the Jewish cemeteries. But they are found sometimes also in more public places. The multilingual inscriptions indicate that they do not come from local initiatives, but initiatives of survivors and their descendants in America or Israel. Such initiatives from outside are not impeded by local authorities, but they are also not perceived as a public responsibility. Only in a few cases, we found exclusively Ukrainian inscripted monuments that suggest a local initiative. As a public task, however, it is considered to commemorate the Ukrainian independence fighters who were murdered in 1941 by the Soviet secret service NKVD. In many cases, the discovery of the deeds of the NKVD was a pretext for pogroms on the Jewish population. Notorious is the pogrom in Lviv (Lwow, Lemberg) in early July, 1941, where several thousand people were murdered by Ukrainian militias, German forces and a mob – the ordinary citizens. Similar cruelties took place at many places in Galicia. This relation is nowhere represented – both events stay disconnected. The past should be innocent, it is anything but that. Against this background, therefore, two publications have to be emphasized that we were attentive during our trip. 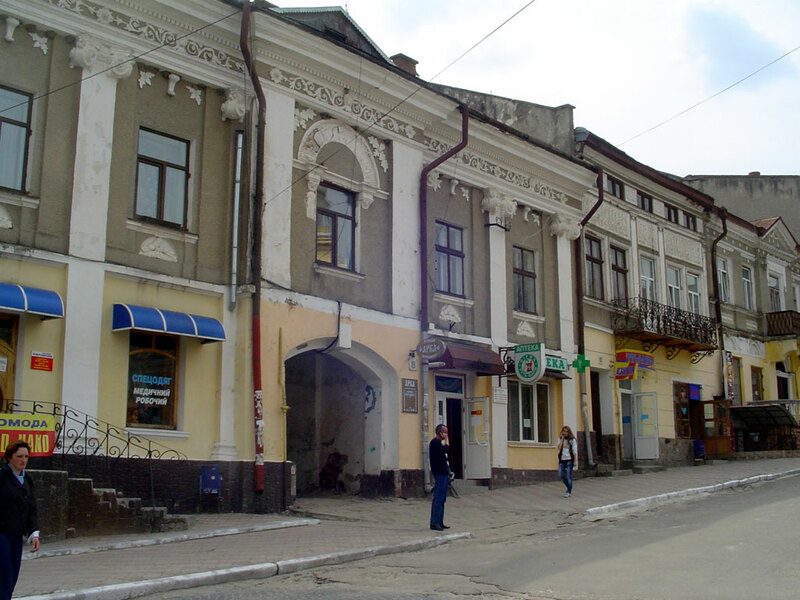 The Ukrainian National Home in Chernivtsi (Czernowitz) has published a guide to the multicultural history of the city. In walks it opens access to the Polish, Ukrainian, Jewish, Russian, German and Armenian history on the basis of architectural monuments. This is a remarkable signal. Ukrainian identity is not teached as ethnically homogeneous, but understood as diverse. In Pidhaitsi we purchased a booklet of Stepan Kolodnytskyi, dedicated to the history of the town. It highlights the multi-ethnic history of the town, where Jews, Poles and Ukrainians lived. Kolodnytskyi describes this coexistence as a historical characteristic of the place and makes no secret of the Jewish majority. The brochure advertises the restoration of important monuments that have left by all parts of the population. The Jewish cemetery is already in an exemplary good condition. People like Stepan we have met again and again. People who have questions about history that can not be satisfied with simple answers, who want to know more and talk and write about it. Alex and his friend Kostya in Lviv, Vasil in Zablotiv, Ivan in Solotvyn. They have different educational biographies. But they want to know the truth and they want to talk about it. To travel in Galicia and Bukovina in the footsteps of Jewish life, means to expose yourself to the question of how and where it was destroyed. The locations of commemoration for this are partly present, partly they have yet to be searched and explored. During our trip some thoughts about the genocide on the Jews of Europe were going through my head that I had been aware of before, but now got a new importance in my mind. 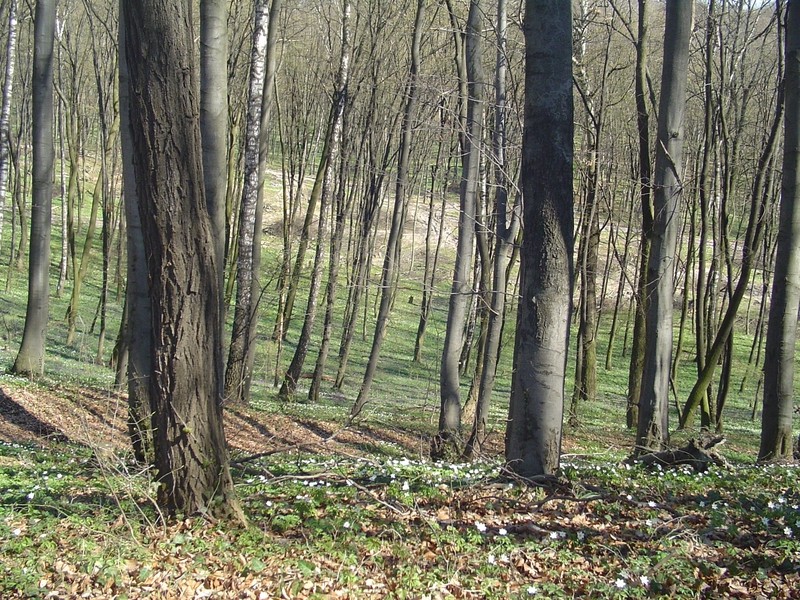 The forest of Lysynychi – an unknown number of people were murdered here. Nothing commemorates them. The image of the Holocaust is incomplete. As more as the Holocaust advances in the past, as more our imagination is shrinking to a few aspects. Most of us think of the great extermination camps, especially Auschwitz. We think of the industrial killing. But with the German attack on the Soviet Union on September 22, 1941, killing is everywhere in the villages, towns and cities. It is not industrial, it does not take place secretely, and it is not anonymous. There are pogroms by the Ukrainian and Romanian neighbors and the killing continues on a larger scale through mass executions by the SS and their helpers. It is a barbaric business that is done by bare hands, cudgels, saws and axes. A significant part of the cartridges, which still can be found at the sites of mass shootings, is pistol ammunition. The killing by the members of the SS often is done in short distance – face to face with the victims. The image we have of the Holocaust and that we pass on to future generations, requires correction to this terrible truth. We know something about how people died, we know little about how they lived. Especially in Germany we go into the question of how it could happen that our parents, grandparents and great-grandparents became murderers. This is without any doubt an important question, because it contributes to immunize against racism wherever it appears in old or new face. We are educated through school and media, to empathize with the victims. The popular Diary of Anne Frank is just one example. About Jewish life, Jewish culture and tradition, many people know next to nothing. This is especially true for Judaism in Eastern Europe – a world that was destroyed and left almost no traces in the collective memory outside of the Jewish communities and a small number of scholars around the world. The destruction was sustainable. We need to be expand our horizon of knowledge in education and media representation. We may read Paul Celan and Bruno Schulz. We also may remember some very simple messages. You shall not kill. You shall not lie. When I say “we” by discribing our experiences, I mean my travel companions Achim and Petra. They earn my special thanks. They trusted unconditionally in my plans and were curious on everything. They talked to me about their impressions and were listening to me. I could not have better companions. My thanks go to Mimi, Sylvie and Sasha, who we met in Chernivtsi (Czernowitz). We had the priviledge to feel something of the old Bukovina. I would also like to thank all those who guided us through towns and villages, who gave us their hospitality and in many cases have shown us the way to the places that we were looking for. Without them we would often have been lost. Thanks to Vasil, Ivan, Mykola, Stepan, Jeremy, Dan, Luba, Karolina, Katharina and many others whose names I unfortunately do not know. Not only did I travel with my friends, I have also written about it – as authentic as I could. Whether I have succeeded in conveying some of our travel experiences, others must judge. During the two-week travel period and the first few days after, I published a total of 13 daily reports. About 1,700 visitors have accessed nearly 7,000 page views of the trip reports. Many have taken lively part of our trip. They have commented publicly or in private e-mails, shared memories and gave advice. I never have traveled with so many people. This was a very special experience for which I am grateful too. One goal of the trip was to capture as many legacies of former Jewish life in photos. These images are to be the necessary complement to previous trips in August and October 2012, and will be the material for a photo exhibition. I left myself on an old analog camera and black-and-white films. The results so far proves me to be right. Now I’m waiting for the developed films and the scans of the negatives. What will they show? Above this will be reported. This entry was tagged Holocaust, Jewish Cemetery, Synagogue. Bookmark the permalink. The museum in Tarnopol was a disappointment, since it mentioned almost nothing of the Jewish presence. It was all displayed from a nationalist-Ukrainian perspective. I believe the town had a Jewish majority before the war. A grand-uncle had a shop there. By chance- and 19th century illnesses, the rest of the family left at the beginning of the 20th century. What luck! “The image of the Holocaust is incomplete. As more as the Holocaust advances in the past, as more our imagination is shrinking to a few aspects.” Wonderful insights and observations here. Thank you for sharing your journey. My grandfather came from Sokol and never spoke about what happened to the rest of his family. Christian I admire you & your friend Achim & Petra undertaking this quest. Viewing your pictures & comments I shudder about the enormity of the crimes and the silence & denial after. You showed us the evidence of a people that lived, thrived and contributed to the growth & culture of these localities with one enormous flaw they were Jews. My own Grandmother & other family members were murdered in Pohorlauti & Zastawna. I also remember the truckloads in Czernowitz with Polish Jews who fled many of the areas you mentioned who were rounded up only to be sent back to certain death. Those stark silhouettes of empty & desolate Synagogues & cemeteries speak volumes with an ear-shattering cry: Why ?? but nobody hears. Thank you and your friends for a wonderful journey with thoughtful insights & observation. I READ YOUR REPORT WITH GREAT INTEREST AND ADMIRATIONFOR WHAT YOU HAVE DID. THANK YOU AND MAY GOD BLESS YOU AND YOUR FRIENDS. As the Jewish granddaughter of Galitzianers, I thank you for your nuanced and evocative piece. It is a hauntingly beautiful post about a haunted land. I must say to you and your friends THANK YOU FOR SHARING. It is really incredible to read your sensitive and guilt ridden? approach to our and your past. The more you go into the past the more you want to know of how all these people had lived. If you think you know how they died you are wrong. Germany spread the idea but the executioners had many faces which one can’t identify NKVD: SS; Ukranians; Poles; Serbs; Romanians you name it they all participated and still do in Boston, Norway, Syria, and so many we know little about. The only thing that changed is the name, today it’s called Jihad. I think I mentioned it before that the guilty ones are and were “the silent majority” who enabled this to happen. We know that that majority is unknown and can’t be heard unless they willingly put themselves into the henchman’s noose and thus silence the others. How those people had lived can’t be reconstructed. They lead ordinary lives just as all those you meet in your daily lives, a diversity of ideas, dreams, hopes, love, disappointments. Few people, nowadays, are concerned with the past, their traditions, their roots. Life is electronic, fast, and few have your sensitivity to look into it. As most of my maternal ancestors originated from the Drohobych area I found this of great interest. I have also shared the link to this to our family history facebook group. Thank you so much for publishing this! !